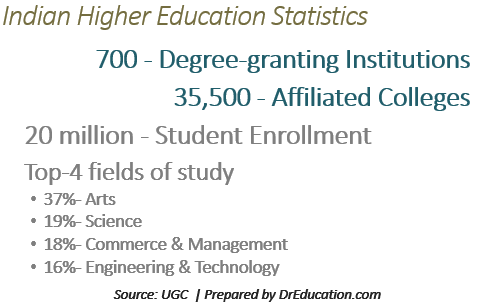 What are the different types of degree-granting institutions (universities/colleges) in India? What is the enrollment of Indian students by level of education? What are the top fields of study for Indian Students? These are some of the frequently asked questions about data and statistics related to the size and scale of Indian higher education system. Given below is the latest information available from University Grants Commission of India. Please click here to see latest data for 2016 and growth from 2008. With 700 universities and more than 35,000 affiliated colleges enrolling more than 20 million students, Indian higher education is a large and complex system. The structure of degree-granting institutions is cumbersome primarily due to “affiliation” and funding sources. More than 85% of students are enrolled in bachelor’s degree programs with majority enrolling in three-year B.A., B.Com. or B.Sc. degrees. One-sixth of all Indian students are enrolled in Engineering/Technology degrees. The Enrollment of Indian Students by fields of study except agriculture and Veterinary science is very miserable situation as much students don't want to peruse these two courses. Its nice data for my PhD topic "HRD practices in Education Sector"
HI Dr. Rahul, I am currently searching of number of finance graduates in India for my research. I tried all possiblities ( researching in Statistics of India) bu i cant find the details i needed. Kindly help me where can i get the data needed? Thanks. Thanks for the information. Do you know of the 20 million students what's the male female ratio? The data you shared here is speaks a lot in itself. It is predictable that in near future there would be more colleges are opening in India with great infrastructure which in turn increase the employment in India.